New information on the death of ch?ken Hachik? Researchers at the University of Tokyo have come up with a new theory to explain the death of the famous dog, Hachik? (also known as ch?ken ['faithful dog'] Hachik?). Hachik? was an Akita Inu who was born in Japan in 1923. He became the pet of Professor Hidesabur? Ueno of the University of Tokyo. For around a year Hachik? would meet his master, at the end of the day, at Shibuya Station. On 21 May 1925 Prof. Ueno died from a stroke while at the university. For the rest of his life Hachik? continued to make the trip to the train station and wait for his master. Hachik? finally died in 1935. Last Wednesday (March 2) saw the premier of OMG! With Peaches Geldof, a tabloid-style television program hosted by British model Peaches Honeyblossom Geldof. The program, airing on Wednesdays at 9pm on the UK's ITV2, is about "people who live unique and often shocking lifestyles - Who are they? What makes them tick? Why do they live the way they do and is it causing them problems or a rewarding way to be?". Episode 1 featured vampires and internet dating. Episode 2, to air next Wednesday (March 9), is to feature Furries, described in the OMG! episode guide as "people who have a strong appreciation for anthropomorphic animal characters and dress accordingly". The episode also features guest panelist Dom Joly, who Peaches described as "quite an embittered man". OMG! With Peaches Geldof had previously contacted furries as part of their research phase. The interview is the subject of several threads on the UKFur forums (registration required). Anthrocon is requesting submissions for this year's conbook, and is offering a sweepstakes to attract artwork, fiction, photography, and articles for the publication. This year's theme is "The Anthropomorphic Institute Of Magic". The lucky winner gets a supersponsor membership for 2011, or an upgrade if already a member. All entries must be received by 11:59 p.m. EDT April 23. It is not necessary to submit material to enter the sweepstakes, and there is no limit on the number of entries. A two-headed, five-legged tortoise was born in Slovakia two weeks ago, and displayed in Žilina on March 7. The left head is named Magda and the right, Lenka. 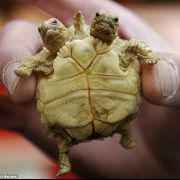 They are conjoined twins of a sulcata tortoise native to the Sahara Desert. If the tortoise survives to adulthood it may reach a length of 1m and weigh up to 75kg. Although all are scientifically known as chelonians there is often confusion about the terms tortoise, turtle and terrapin. Although there are regional differences, a generally accepted definition is that chelonians on the land are tortoises, those in the sea are turtles and the ones in ponds/lakes/rivers/swamps are terrapins. Apparently this was far from the first notification sent by disgruntled copyright-holders. Regardless, lulz.net's administrator appears confident of resuming service soon. Update (11 March): The board is back up, apparently at Tocici.